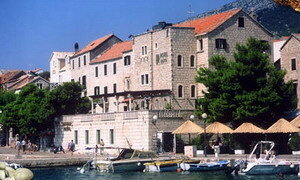 The island of Brac is the third largest island of Croatia. Mountainous in aspect it is nearly 36 km long and 12 km wide. Its precipitous southern coastline rises up to 778m above the sea level at Vidova gora, the highest peak of all the Croatian islands. Composed primarily of limestone and dolomite, the quarries of the island of Brac have been a source of stone for building decorative stonework for centuries. The old Romans have known its quality and used this very stone to build cities, amphitheaters, temples, palaces and graves all over Dalmatia. The population of the island is about 13,000 people within its 23 little towns, which are: Bobovisca, Bobovisca N/M, Bol, Dol, Donji Humac, Dracevica, Gornji Humac, Lozisca, Milna, Mirca, Murvica, Nerezisca, Novo Selo, Postira, Povlja, Pucisca, Praznica, Selca, Splitska, Sumartin, Supetar, Sutivan and Skrip. Located in the center of the town, it is an ideal combination of modern interior in a baroque fortress. 5 meter distance from the sea provides perfect conditions for rest and relaxation, while the proximity to all cultural events and sports facilities enables one to stay in the center of events.